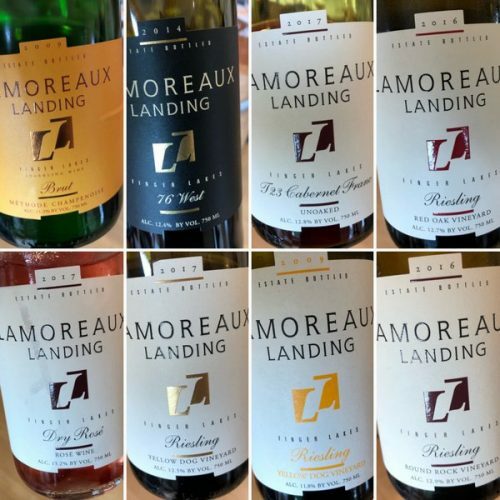 There have been vineyards on the site of what is now Lamoreaux Landing since 1947. It’s an estate of 750 acres on the eastern side of Seneca Lake, with 120 acres under vine in some 20 different blocks. We visited with owner Mark Wagner, who manages the vineyard, and Josh Wig, who is co-owner and looks after the winery and sales. They represent the third generation of their family on the property. Mark planted vinifera in the 1970s for the first time, and started the winery in 1992, with first vintage released under the winery name the 1990. They still grow a few hybrids but the Labruscas have all gone. All vineyards are managed with four-cane Scott-Henry trellising, and Riesling accounts for half the acreage. The Rieslings and Cabernet Francs here are pretty impressive.